Historically, CHAs have always contributed significantly in responding to demographic and epidemiological transitions especially in fragile settings in sub-Sahara Africa. 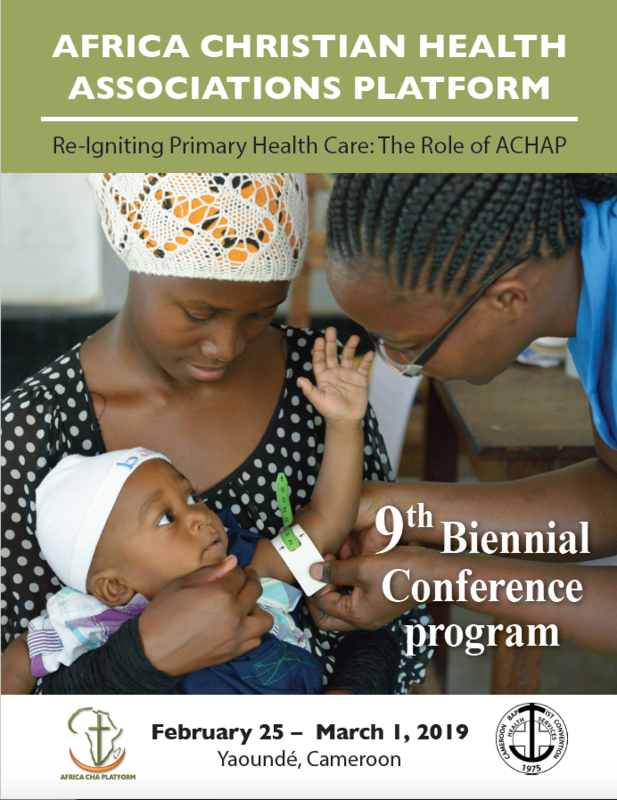 Hence, the conference will be an opportunity for CHAs and partners, members of ACHAP to explore the ACHAP role in implementing PHC for UHC, which role cannot be overemphasized. 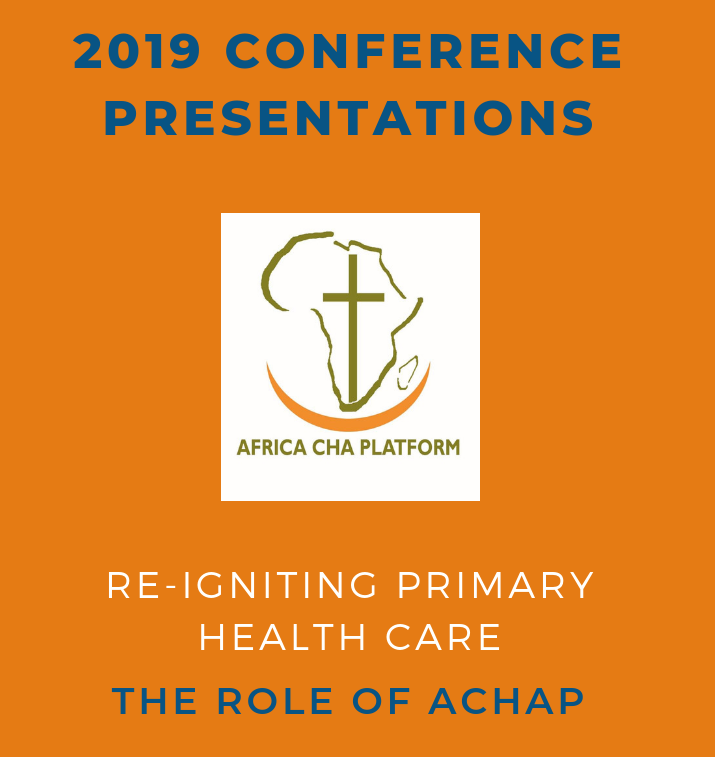 The PPT presentations for ACHAP 2019 are available in this Google Drive folder. If you have difficulty accessing the folder or don’t find the presentation you are looking for, kindly let us know by emailing communications@africachap.org. Download the ACHAP meditation here. Created in 1936 by the Baptist missionaries from the United States of America, the Cameroon Baptist Convention (CBC) Health Services, the medical arm of the Cameroon Baptist Convention, fully transitioned in 1975 to an indigenously led Organization offering holistic services to millions of people at both facility and community levels. Its now serves all regions of Cameroon through a network of 7 tertiary Hospitals, 32 Integrated Health Centers and 52 Primary Health Centers. CBCHS has a workforce of over 4500 permanent staff and its facilities consult slightly above 1.2 million and admit about 60,000 patients annually. Besides facility based services, Residency and Training Programs for Medical Doctors and other health professionals, the CBCHS runs several robust programs that meet complex community health needs. For instance, through the Life Abundant Primary Healthcare Program, CBCHS has set up over 80 primary health care centers in underserved communities some of which have now become hospitals. Its disability program addresses the socio-economic and health needs of Persons Living with Disabilities and promotes an inclusion. The CBCHS Non-Communicable Disease (NCD) Control and Prevention Program, runs facility and community based activities to reduce the impact of NCDs in communities. The CBCHS drug procurement, and distribution department known as Central Pharmacy (CP) is one of the largest in the country. It is now a certified procurement, manufacturing and distribution plant that produces infusion fluids, high quality mineral water and other sterile and non-sterile products which are used in CBCHS facilities. The CBCHS is well known for its contributions to the HIV and AIDS response in Cameroon and in the West and Central African sub regions since 1994. 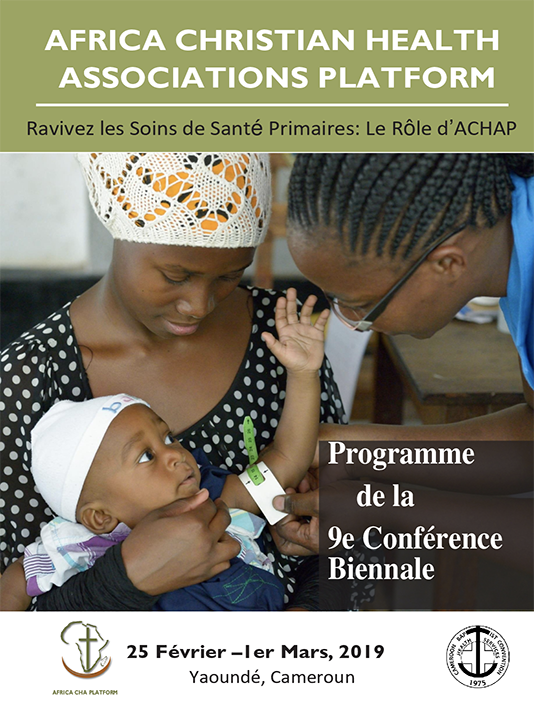 CBCHS introduced Prevention of Mother-To-Child Transmission HIV services in Cameroon in February of 2000 and has since then remained a technical partner to MOH in PMTCT. From 2011 till date, CBCHS is implementing a CDC/PEPFAR sponsored named “HIV-Free” now in four regions of the country (Center, Littoral, Northwest and South West). As an experienced provider of HIV and AIDS community and facility based services, CBCHS is strengthening the capacities of communities, local organizations in Cameroon and in other African countries for effective HIV response. In 2011, the CBC Health Services signed a Memorandum of Understanding (MoU) with the Ministry of Public Health based on which CBC Health Services intensified Health System Strengthening (HSS) efforts to further improve health care delivery in the country. For departures: Please send a message to admin@africachap.org to let ACHAP coordinators know when you will need to be transported to the airport. Accommodations: Your hotel stay is taken care of as part of your conference registration. Health: A yellow fever vaccination is an entry requirement. Please travel with your yellow card to the conference so that it may be displayed upon arrival. Additional considerations: Electrical sockets are the same as in France. Please make sure you have a travel adapter to plug in your devices.